In order to provide prospective students with the best chance at having a great education, we have compiled this list of the top universities and colleges in South Carolina. Some schools may excel at online programs while others may focus exclusively on the traditional, on-campus aspect of higher education. Regardless of the delivery format, these schools excel at providing a quality education for their students. The great state of South Carolina offers a broad range of online and traditional colleges to choose from for those seeking a higher education. Here at Best Value Schools, we’ve compiled a list of all the best colleges the state has to offer. Both private and public universities are available online and on-campus and provide a various range of majors. With a booming economy and lower unemployment rate, companies are looking for qualified candidates to join their business. Thanks to this increase, graduate and postgraduate education have risen in attendance from students in recent years. Working full-time employees and stay-at-home parents may consider continuing their studies through some of the highest ranked online colleges in South Carolina. The highest ranked online colleges in South Carolina feature some of the best associate, bachelor, master and doctorate degrees. South Carolina promotes many different initiatives to entice students to consider online learning. South Carolina is part of the Southern Regional Education Board (SREB), an education group consisting of 16 states from Oklahoma to Delaware. SREB membership benefits allow access to the Academic Common Market (ACM). The agreement allows students in South Carolina to enroll in select out-of-state programs while paying in-state tuition. As a result, many online colleges in South Carolina are highly accessible and up-to-date. South Carolina’s demonstrated commitment to making distance learning more accessible and technologically innovative makes online college a worthwhile investment for many. Online degrees in South Carolina provide the same level of quality as education in the classroom. As part of our list of highest ranked colleges, we look at the quality of their online and traditional academic programs, graduation rate, job placement, and tuition costs for the 2017-18 school year. The graduation rate is the student’s ability to graduate within four years of starting school. Each of these qualities helps determine how well a student will succeed by enrolling in a South Carolina college in the U.S. Read through our list of Best Colleges in South Carolina so you can find the absolute best options to fit your needs and lifestyle. Note: Tuition costs are an average rate for the schools. Individual programs are subject to higher rates. Please check the school website to get an exact tuition rate. The University of Southern Carolina is the current highest ranked online college in the entire state of South Carolina. USC-Columbia is the state’s flagship public institution and has held the crown as the most popular online school choice for quite some time. With a solid graduation rate, the number of degrees for undergraduate students and graduate students, and the affordable tuition, it makes it a top choice. The graduate degrees include education, engineering, public health, and information technology. Bachelor degrees are available in hospitality management, information science, special education, liberal studies, and organizational leadership. Also, students can declare majors after 45-60 credit hours and finish their degree online. Starting in 1801, USC-Columbia is now the second oldest college in the state. The school has nearly 35,000 students attending today and the main campus’ location in downtown Columbia. The school offers over 85 undergraduate majors, and there are students from over 100 foreign countries and student activities across 400 groups. Clemson University is a national leader in offering unique avenues for higher education. The university comes in as one of the highest ranked online colleges in South Carolina thanks to its outstanding 82 percent graduation rate. With programs in Athletic Leadership, Biological Sciences, Construction Science Management, and Healthcare Genetics the school lives up to its unique opportunities. Blended programs are also available. Also, hybrid courses, independent studies, and traditional on-campus courses are all available for students. The school also offers professional programs for those not interested in a degree. 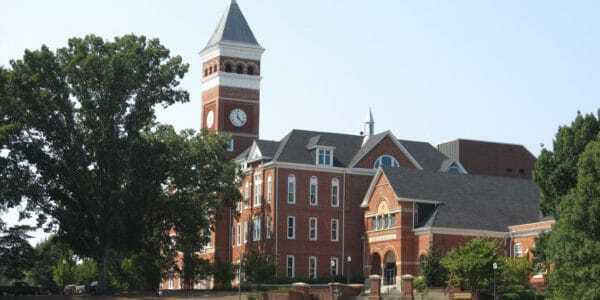 Clemson University is an American public, coeducational, land-grant and sea-grant research university in Clemson, South Carolina. Clemson is the second largest school in South Carolina. The university has around 23,000 students and offers nearly 200 total programs including the online programs. Anderson University has one of the most flexible ranges of programs making it one of the highest ranked online colleges in South Carolina. Several programs offer concentrations in a particular field, permitting students to receive a more focused educational experience. Most of the degrees have different emphases for students. There are 16 undergraduate programs and nine graduate programs. Highlighted are five different areas for the Master of Business Administration (MBA) and three for criminal justice and emergency services management. The university is also part of the South Carolina Baptist Convention. Beginning as a four-year college for women in 1911, today, the university is an educational, Christian institution in Greenville, South Carolina. As one of the highest ranked online colleges in all of South Carolina, Columbia College helps students earn their bachelor’s degree and master’s degree online in a select number of prestigious programs. Students can consider selecting undergraduate programs in criminal justice, disaster and emergency management, fire science, and R.N. to B.S in Nursing. A master’s in criminal justice and athletic coaching is available at the graduate level. Columbia College, beginning in 1854, is one of the oldest women’s colleges in the nation. The College has a strong emphasis on leadership development and strives to prepare students for career placement and success after college. Trident Technical College is one of the highest ranked online colleges in South Carolina, even though it is only a 2-year technical college. WIth over 20 online programs, it beats out some of the traditional 4-year colleges’ online programs. Almost all of the courses don’t require students to attend school. A few of the programs offered are an associate of arts, criminal justice, business technology, and homeland security. Courses are available in a seven-week format. The college is in Charleston, South Carolina and offers over 150 programs in fields such as social sciences, business, STEM, aeronautics, and health care. North Greenville University is a unique university as it is limited to students who are at least 22 years of age who are enrolling in any of the College of Adult Professional Studies (CAPS) online programs. The CAPS makes them one of highest ranked online colleges for adult education. Returning students can start/finish their degree in business, Christian ministries, criminal justice, elementary education, general studies, and psychology. North Greenville University is a Southern Baptist university beginning in 1891. The university started as a high school and later became a college in 1949. Today, the university has more than 2,000 students in attendance and offers degrees in a variety of fields. Coastal Carolina University has several graduate and undergraduate online programs. Programs include marketing, geospatial technologies, health administration, literacy, information systems, and teaching and training. Coastal’s Office of Online Learning (COOL) helps advance the university’s efforts to strengthen the online courses and programs for student’s success. Coastal Carolina University began in 1954 as a small local college, and today it is a thriving nonprofit university offering over seventy undergraduate programs and twenty graduate programs to students from across the nation. USC-Aiken offers online courses through the Department of Continuing Education. Although the programs do not lead directly to a degree, USC-Aiken has many opportunities for students to earn certificates of completion. Also, the university offers unique opportunities for students that might not find in South Carolina online schools, including online programs for students and tailor-made training for the professional development of company employees. Finally, USC-Aiken offers a truly unique program for their 100 percent online equestrian classes. Students can choose from 26 different courses to participate in the long-standing equestrian tradition of Aiken, South Carolina. The University of South Carolina Aiken is a four-year, public, coeducational university in Aiken, South Carolina. Charleston Southern University online provides bachelor degrees in Organizational Management, Healthcare Management, and Computer Systems and Information Sciences to name a couple. The institution also offers a broad range of fully online graduate degrees in areas like Analytics, Christian Studies, Project Management, and more. Charleston Southern University is a Christian, liberal arts institution, affiliated with the South Carolina Baptist Convention, and is South Carolina’s largest accredited, independent university. The school successfully strives to intermingle faith in learning with leadership and service. Limestone College offers several different bachelor degree programs for its students online. Those degrees include business administration, computer science, arts, social work, and accounting. By limiting the number of classes students can enroll in each semester to two (totaling 36 credit hours), Limestone makes sure students won’t overload their academic schedule. Limestone College is a private four-year, coeducational liberal arts college located in Gaffney, South Carolina. Lander University offers online degrees and a BSN completion option for registered nurses online. The admission requirements for the BSN program include completed courses in anatomy, physiology, and statistics with a GPA of 2.6. Students have to complete 32 credits at Lander; the necessary nursing courses satisfy 24 of those. Most students complete their 126-credit online degree in less than two years. Lander University, one of the best online colleges in SC, was founded in 1872 as a women’s college. The school is located in Greenwood. Greenville Technical College believes both in class learning as well as a hands-on approach to help students develop relevant skills to their field of study. The type of online classes GTC offers include MRI, Computed Tomography, and Cancer Data Management, and they also provide online tutoring to meet individual student needs. As a bonus, online classes cost the same as in-state tuition. At York Technical College there are three types of distance learning courses for students to take. There are online courses, hybrid courses, and teleclasses. Students who decide to take an online course, or a course which has an internet component, should have access to a computer. All online credit courses will use D2L as the learning management system. York Technical College or simply York Tech is a 2-year technical college in Rock Hill, South Carolina. Unfortunately, the school doesn’t have complete online programs but does boast a lot of online classes. The University of South Carolina-Upstate has an excellent student to faculty ratio for its programs. In the education, nursing, liberal arts, sciences and liberal arts programs, the ratio is 18 to 1. The university’s classes prepare students to meet the demands of a changing labor force. To help teach adults a second language, a service-learning program made by the school. Students in the program help in community events as a way to give back to its people and engage area citizens. The University of South Carolina-Upstate is home to the Spartans. Nearly 6,000 students are attending the university in a combination of bachelor’s and master’s degree programs at the school. The Medical University of South Carolina is for adult learners who want to work in one or more medical fields. The school has undergraduate, continuing education and graduate program through six colleges, which are dental, nursing, pharmacy, medicine, health professions and graduate studies. Hands-on training, clinical and research skills are at the university’s spine center, simulation center, and wellness center. In addition to training students, the school gives medical care to actual patients. Postgraduate training is available to students as well. The admissions, financial aid, registrar, and enrollment management offices are in Charleston, South Carolina. The University of South Carolina-Beaufort provides adults in South Carolina and parts of the country to have a comprehensive education that encompasses in demand and traditional fields like liberal arts, sciences, medicine, education, and business. At USC-Beaufort, it has a main campus in Bluffton, South Carolina. The university’s other campus is in Hilton Head. The school began in 2004. A total of about 1,500 students attend the college. At Southern Wesleyan University, the School of Business offers undergraduates both on-campus and fully-online programs. Both formats are available for general studies degrees. The School of Education and the School of Social Science offer online degree programs as well. Graduate programs include online options in the School of Education and in the School of Business. Not to mention, there are several programs available for non-degree seeking students. Francis Marion University nearly has 95 percent of the students enrolled in its bachelor’s and master’s programs that are from South Carolina. Wooded areas and natural landscapes surround the more than 500-acre campus. Classes are smaller than average with no more than 21 students enrolled in the course. Traditional subjects at the school include health, sciences, and business. Supplementing the school’s main campus in Florence is the performing arts center that is near downtown. A rolling process handles school admissions. Francis Marion University began in 1970 as a state-assisted institution. In 1886, Winthrop University opened as a school to train teachers before converting from a college into a university in 1992. Winthrop believes in a student-centered education and upholds their stands in the online program with the same rigor, quality, and academic standards. Winthrop offers some undergraduate and graduate courses online. Converse College, offers online degree programs through its Office of Distance Education. In addition to providing services to students to help them succeed in their programs, the school also trains it thoroughly and part-time professors to teach in an online environment. As a result, students may benefit from receiving the same course content as students on campus, while having it delivered the way that best facilitates online learning. Coursework can be readily available through Moodle, an online learning platform that students can access anytime at their convenience. Converse College began in 1889 as one of the first women’s colleges in the entire country. The Citadel Military College of South Carolina has an honorable tradition of educating brave men and women who serve our country. The school tries to help make life easier for active military members by allowing them to further their education. The school offers online degree programs through its Citadel Graduate College. Students can enroll in a graduate degree or certificate programs, as well as undergraduate completion programs, that are entirely online. Those who haven’t finished their bachelor’s degree can take courses in the school’s criminal justice or business administration completion programs. Others can pursue an advanced degree in areas such as leadership, intelligence, and international politics. Formerly Columbia Bible College, Columbia International University is a Christian school located in the capital city. There about 1,200 students are in attendance, with an approximately equal amount of undergraduate students and graduate students. The school began in 1923. Presbyterian College, known as PC, was founded in 1880, inspired by a way to help orphans get their education. PC only recently added online learning programs to better meet the needs of the students who need to meet requirements in different locations. Unfortunately, there is not much information offered on PC’s online programs. The Technical College of the Lowcountry provides quality and affordable programs that provide students with associate degrees, diplomas, and certificates. Offerings include developmental education, arts and sciences, career development, and specialized, contract courses tailored for specific businesses and industries. Horry Georgetown Technical College was founded in 1966 and is a two-year, public college that offers more than 80 degrees, diplomas, and certificates. HGTC offers a number of online or hybrid programs for students looking for a more flexible schedule and provides online counseling services, advising, and even access to the online bookstore. Spartan Community College is a public, two-year suburban college that seeks to give students the resources they need in order to live responsibly as citizens. Spartan Community College is exceptional because students are able to save 60-100% of tuition when taking online courses. Students are given access to all online resources and over 150 online courses in addition to the degrees and certificates offered. The list draws from the highest ranked colleges around South Carolina. The combination of the number of online programs available, graduation rate, tuition cost, and other factors determined each school’s evaluation and rank. See our methodology page for more detail. We invite schools featured on our list or not highlighted to reach out for possible inclusion in an updated version of our highest ranked colleges in South Carolina. We’re constantly looking to recognize top-tier institutions.